The 1997 Custom Big Dog Proglide for sale has a Custom "AWARD WINNING" paint job and it's fast having been clocked at 145mph! The high performance engine has been balanced & blue printed. The 80" Evolution motor has Edelbrock heads, S&S cases, 560 EV57 Cam, Wiseco Pistons, Thunderheader, Crane Hi 4 Ignition, S&S Super E carb. The custom Big Dog motorcycle for sale has been babied and is an awesome "special construction" motorcycle from the Big Dog factory. It Dyno's at 92 horse and has a 5 Speed transmission, with Andrews close ratio gear set. It has a custom rubber mount frame, wide glide front end, w/ Progressive rate springs. The motorcycle's rear shocks are Progressive and it has GMA dual disc front brakes, GMA rear brakes, Chrome rear swingarm, a Corbin motorcycle seat, quick detach saddlebags, lots of CHROME plus many more custom parts and accessories; there is simply too much to list and to top it all off, the bike only has 30,000 miles on it currently and comes with a clean and clear Arizona title. The motorcycle is located in Bisbee Arizona and my very cheap asking price is only $8500. If you're interested you can email me your questions using the space below that has been provided by Strike Lightning Motorcycles for Sale (and PLEASE do not neglect to include your contact information in your email or to provide a phone number or email address if you leave a message!) so that I can respond with answers to your questions as quickly as possible. You won't find a better deal on a custom Big Dog Motorcycle for sale in Arizona, on Craigslist or in an Ebay auction so hurry and make an offer before it gets away from you! 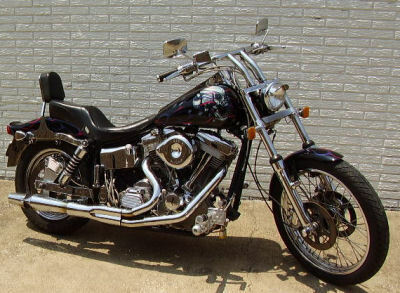 Strike Lightning would also encourage bikers to submit a review of the 1997 Custom Big Dog Proglide for Sale to make the biker community aware of any problems that are commonly associated with the custom 1997 Big Dog ProGlide or to highlight its positive features and help potential buyers make informed decisions.